Humility has great power and destroys the devil. It is the strongest shock that we can give him. Where there is humility, there is no room for the devil. And where there is no devil, there are, of course, no temptations. 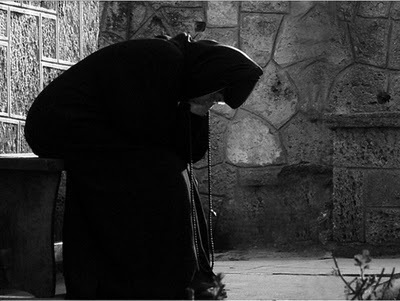 Once an ascetic pressed a devil to recite: Holy God, Holy Mighty, Holy Immortal, have mercy on us. The devil said, Holy God, Holy Mighty, Holy Immortal, but he would not say, “Have mercy on us.” The ascetic insisted, “Say, ‘have mercy on us’.” But to no avail! Had the devil complied, he would have become an angel again. The devil will say anything except have mercy on me, because this requires humility. In every have mercy on me there is humility and the soul that utters these words receives what she is seeking: God’s great mercy. No matter what we do, we need humility, love and nobility. It is very simple to acquire these things, but we make it complicated and difficult. Every chance we get, we should do what is difficult for the devil and easy for human beings. Love and humility are hard for the devil and easy for us. Even a sickly person who cannot become an ascetic can defeat the devil with humility. In just one second, we can turn into an angel or a devil. How? We can choose pride or we can choose humility. Do you think that it took hours for Lucifer to turn from an angel into a devil? It all happened in seconds! The easiest way for us to be saved is through love and humility. That is why we must start with love and humility, and then go to the rest. Pray that we may always give joy to Christ and distress to the devil, since the devil likes hell so much that he does not want to repent. Marriage was ordained by God as a blessing to the human race. A certain wise man in the Scriptures, when enumerating which blessings are the most important, included “a wife and husband who live in harmony” (The Wisdom of Sirach 25:1). From the beginning, God in His providence planned this union of man and woman. God has put into a man’s heart the capacity to love his wife and into a woman’s heart the capacity to love her husband. There is no relationship between human beings as close as that of husband and wife – if they are united as they ought to be. God’s purpose in ordering marriage is peace. If a man and a woman marry to satisfy their sexual appetites, or to further the material aims of themselves or their families, then the union is unlikely to bring blessings. But if a man and a woman marry in order to be companions on the journey from earth to heaven, then their union will bring great joy to themselves and to others. When we speak of the wife obeying the husband, we normally think of obedience in military or political terms: the husband giving orders to the wife and the wife obeying them. But while this type of obedience may be appropriate in the army, it is ridiculous in the intimate relationship of marriage. Obedience should not be confined to the wife; the husband should be obedient in the same way. St. Paul writes: “Be subject to one another out of reverence for Christ” (Ephesians 5:22). Thus a good marriage is not a matter of one partner obeying the other but of both spouses obeying each other. When the Apostle Paul says: “Husbands, love your wives,” he does not stop at this, but gives us a measure for true love by adding, “as Christ loved the Church” (Ephesians 5:25). And how did Christ love the Church? “He gave Himself up for her,” the Apostle says. So even if you must die for your wife, do not refuse. Love is most powerfully present in a marriage when accompanied by respect. A good marriage is like a castle. When husband and wife truly love and respect each other, no one can overcome them. In the providence of God, when a husband is spiritually weak, his wife is spiritually strong; and when a wife is weak, her husband is strong. Nothing can destroy love that is rooted and founded in Christ. St. John Chrysostom’s advice to young husbands: Speaking with your wife . . . .
Never speak to your wife in a mundane way but with compliments, with respect and with much love. Tell her that you love her more than your own life, because this present life is nothing, and that your only hope is that the two of you pass through this life in such a way that in the world to come, you will be united in perfect love. Show her that you value her company, and prefer being at home to being out at the marketplace. Esteem her in the presence of your friends and children. Praise and show admiration for her good acts; and if she ever does anything foolish, advise her patiently. Pray together at home and go to Church; when you come back home, let each ask the other the meaning of the readings and the prayers. If your marriage is like this, your perfection will rival the holiest of monks. Emperor Nicephorus of Constantinople reigned from 1078 until 1081. He decided to build a cathedral that would be almost as grand as St. Sophia. When it was ready, the patriarch of Jerusalem, the patriarch of Alexandria as well as the patriarch of Constantinople were all invited to consecrate the beautiful new church built by the emperor. Announcements had been made about the consecration for several months in advance so that everyone would have time to travel to the great city of Constantinople; remember that during that time there were no cars, planes or trains. Everyone had to travel either in carts pulled by oxen, horses or donkeys, and those from great distances had to cross the sea in boats. When Nicephorus’ cathedral was ready to be consecrated there were three patriarchs, forty metropolitans, and thousands of priests present, since this was an imperial cathedral. Thousands of carts and wagons converged on the city as the faithful came from all around. Everyone brought something for the new cathedral: rugs, barrels of wine, oil, flour, candles, etc. Each person wanted to offer something! Poor though she was, she had a very merciful heart! What went through her mind as she saw the oxen pulling such heavy loads of goods for the celebration of the new church? ‘I don’t have any money, or rugs, or oil, nothing. But I can give the animals a little grass.’ Still, she was afraid because she did not own land, so where would she get the grass without doing something wrong? Anastasia opened her sack of grass and put it in front of the oxen, saying, ‘Lord, accept this bit of grass, and forgive me, for I have nothing to bring to the church consecration, and even this is not from my own land!’ She wept as she said these words; then when the oxen had finished eating, she also went to the church for the consecration. She was astounded at what she saw in the church: so many people and such rich adornments for the new temple! The church was prepared like a bride for a wedding with all the embellishments ready for the consecration that was to take place the following day. Anastasia went to an icon in the rear of the church, where women generally would stand; there the poor old woman, her face wrinkled with age, an old scarf on her head, the poorest of sandals on her feet and wearing a raggedy dress, knelt and prayed to the Lord, saying, ‘Lord, forgive me, for I have not brought any kind of offering for the church! I have nothing. The emperor is a king on earth and will be great in heaven, but I am so poor and have no money, nothing to offer.’ and as she prayed her tears dropped to the ground. Then Emperor Nicephorus, with all his entourage and servants, came into the church. His chief minister, Peter was his name, pointed to the dedication plaque – since in churches and monasteries that are historical monuments there are dedication plaques over the doors – and drew the emperor’s attention to it. The plaque was made of marble and the golden inscription read ‘To the glory of the all holy Trinity of the Father and of the Son and of the Holy Spirit, this holy church was built and provided for by me, the Emperor Nicephorus.’ The emperor fully approved of the way the inscription had been executed, since he was the one who had ordered it. Thus, the emperor, empress and a crowd of generals and other officials went into the church to see how it was prepared for the big event of consecration the following day. Everything was in order: beautiful frescoes on the walls, icons with golden risas, fine covers for the icon stands and curtains at the royal doors, gold-embroidered vestments, chandeliers, holy vessels for the altar, Gospel book, everything was in perfect order. The people in the rear of the church saw the inscription and froze with fear. Before they had clearly read the emperor’s name on the inscription. There were people all around, no scaffolding was in the church for someone to reach the plaque and change the writing; thus, no one could explain how this change had happened. The men read the inscription and began to talk among themselves. Those present were afraid to tell the emperor, so they called the head minister, Peter, and showed the inscription to him. The emperor then called all his chief servants and told them, ‘This church is not to be consecrated until we find this widow! Once she is found, we will do the consecration in her name because she is greater before God than I am.’ Then he gave the order to search throughout his entire empire for the widow Anastasia. Now, it was God’s will to reveal this mystery quickly, and He did so through another widow who was about the same age as the blessed Anastasia. This woman was in the crowd, but was not aware that Anastasia was also there. The old woman told the emperor where the widow Anastasia lived, and he then immediately sent servants to find her and bring her to the church. Servants, riders and horses quickly headed off to the edge of Constantinople to find Anastasia and bring her to the emperor. When they reached the place that the old woman had told them, they found some children playing. The men went to the house in the untilled garden. What did they find at the widow Anastasia’s door? No lock. No bolts. No latch. When someone has nothing, they are not afraid of thieves. The door was held shut by a string tied onto a nail. It was obvious that the old woman was not home. The few belongings that she had were in plain sight, but there was nothing worth stealing. She had gone to the church for the consecration. ‘No. Anastasia left with an armful of grass to the farm market,’ the children answered, not knowing that she had gone to the church. – ‘I did not bring anything, Your Majesty, because I am so poor!’ She did not consider the armful of grass that she’d given the oxen as any kind of offering. And there it was on the inscription, ‘To the glory of the all holy Trinity of the Father and of the Son and of the Holy Spirit, this holy church was built and provided for by me, the widow Anastasia.’ The men had to read it to her, since she was illiterate. An armful of grass, given in the name of the Lord with humility and a sorrowful heart far surpasses all the wealth of the Emperor Nicephorus. That is what God desires! St. Ephraim the Syrian says, ‘God does not look upon the quantity of offerings that you make, but the heart with which you bring these offerings.’ However small your offering may be, give it with humility and a sorrowful heart that you cannot offer more. That is true almsgiving.